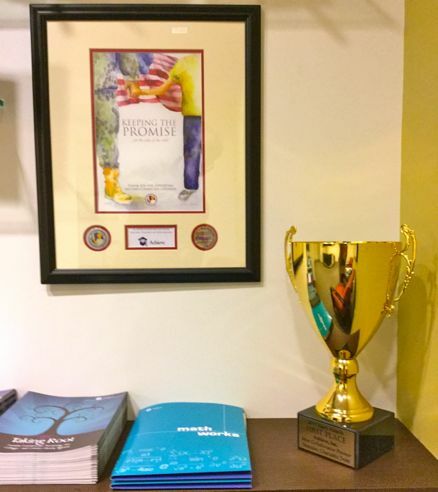 Read a brief history of Achieve. 1996: Achieve is founded at the National Education Summit by leading governors and business leaders. 1998: Achieve begins its Academic Standards and Assessments Benchmarking Pilot Project. 1999: Achieve sponsors a National Education Summit. 2001: Achieve sponsors a National Education Summit; Achieve joins the Education Trust, Thomas B. Fordham Institute and National Alliance of Business to launch the American Diploma Project (ADP) to identify the “must-have” knowledge and skills most demanded by higher education and employers. 2004: The American Diploma Project releases “Ready or Not: Creating a High School Diploma That Counts.” This groundbreaking report – the result of over two years of research – identifies a common core of English and mathematics academic knowledge and skills, or “benchmarks,” that American high school graduates need for success in college and the workforce. Education Week later named “Ready or Not” one of the most 12 influential research studies. 2005: Achieve co-sponsors a National Education Summit on High Schools, with the National Governors Association; the American Diploma Project Network is launched with 13 inaugural states. 2007: The ADP Assessment Consortium launches to develop common Algebra II end-of-course assessment, which was, at that time, the largest multi-state effort to develop assessments to date. 2008: Achieve releases "Out of Many, One: Toward Rigorous Common Core Standards from the Ground Up," a report that found that individual state efforts to set college- and career-ready standards for high school graduates actually led to a remarkable degree of consistency in English and mathematics requirements. 2009: Work begins on the development of the Common Core State Standards; Achieve partners with the National Governors Association and Council of Chief State School Officers on the Initiative and a number of Achieve staff and consultants serve on the writing and review teams. 2010: The final Common Core State Standards are released; Achieve begins serving as Project Management Partner for the Partnership for Assessment of Readiness for College and Careers (PARCC). 2011: Achieve begins managing the state-led development of the K-12 Next Generation Science Standards. 2013: The final Next Generation Science Standards are released. 2016: Achieve celebrates 20 years of raising expectations. 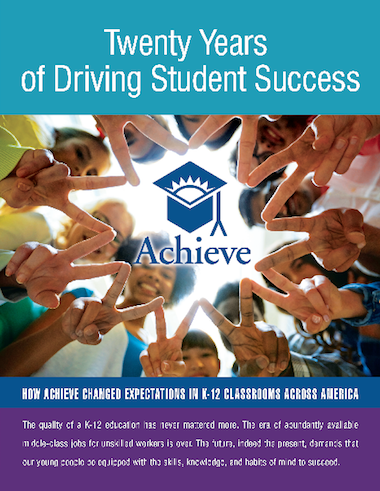 For a more in-depth look at the past two decades of Achieve, click here.